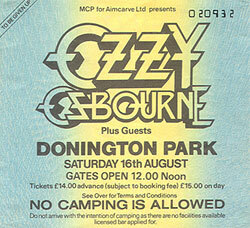 All Ozzy Osbourne items listed below are authentic and very limited. We do not carry multiple items. All prices and availability are subject to change. All prices include shipping and handling for all USA customers. All other destinations will require actual shipping cost to complete transaction. Have a question? Ask us before purchasing the item. Thank You. 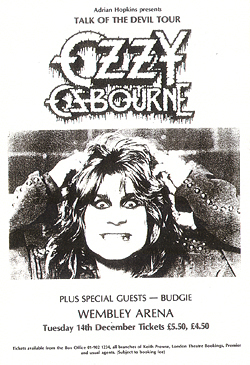 Description: 5x7 BW Ozzy Osbourne 1982 UK concert handbill. Opening Act: Budgie. 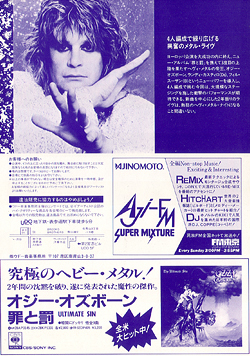 Description: 7x9 color Ozzy Osbourne 1984 Japanese concert handbill. 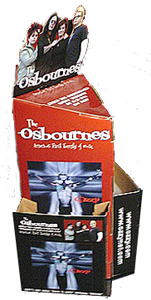 Description: The Osbournes TV Show display #1. Size 10x20. Item in VG+ condition. 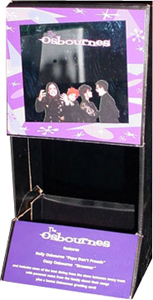 Description: The Osbournes TV Show display #2. Size 10x20. Item in VG+ condition. 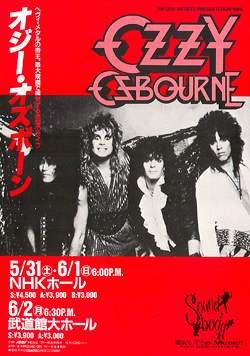 Description: Ticket Stub in VG+ condition. Size 3x3 three color. Opening acts Scorpions, Motorhead, Bad News and Warlock.